CommonBond offers a modernized student loan borrowing experience with just 3 simple steps to get the process started and you on your way to getting the loan you need for the school year. When you take out a private student loan with CommonBond, you are providing kids with unprecedented access to schools, teachers, and technology. CommonBond has a team dedicated to making sure that all of your questions get answered. Feel free to give them a call or shoot them an email with anything related to your student loan. 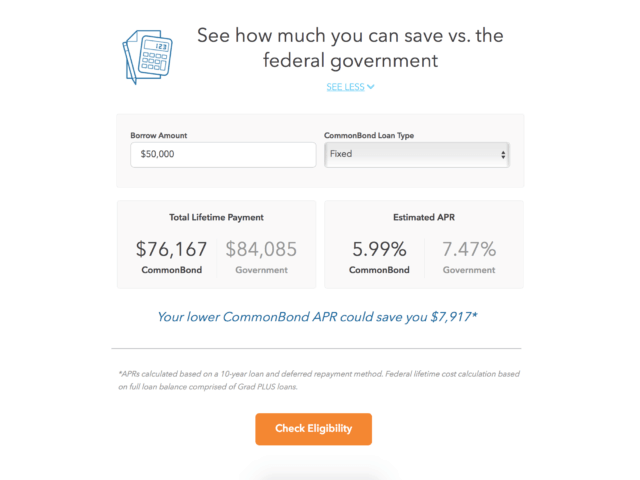 You may have heard of CommonBond in the past specifically regarding refinancing student loans and their great rates. Well, the company offers quite a bit more than just refinancing student loans. 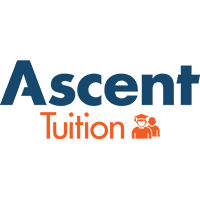 This page is going to talk specifically regarding their private student loan offerings and how they can help you take out what you need for either your MBA or just for your graduate or undergraduate degree. 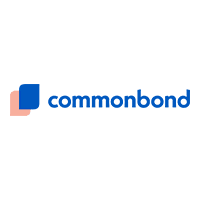 As we have showcased in the past on the Student Loan Calculator, CommonBond is gone of the leaders in the student loan space due to the technology they are developing to help you manage your loans like never before. Below you will see some of the additional highlights that are offered by CommonBond and how they can help you win when it comes to your education. 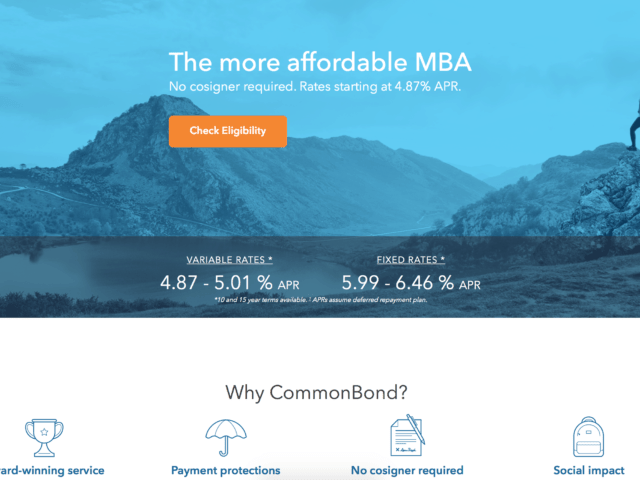 CommonBond offers an assortment of private loan options including MBA Student loans along with undergraduate & graduate student loans. These loans offer both competitive fixed and variable rates which allow you to choose what option works best for you. Among these unique term options, CommonBond offers these loans for 5, 10, or 15 years depending on the loan amount and what you qualify for. 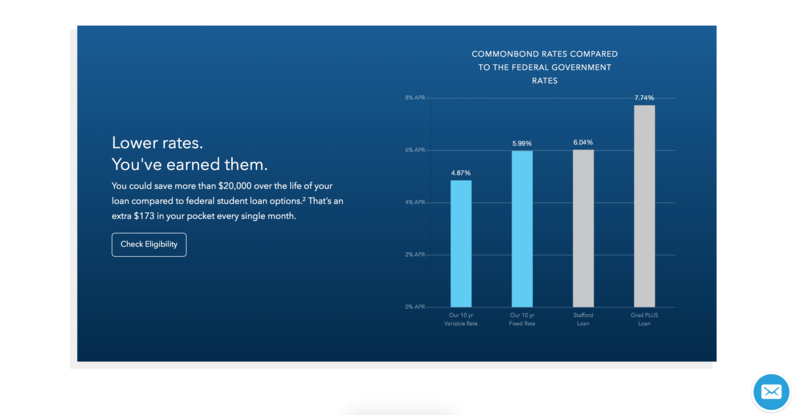 You are more than just a client with CommonBond, they look at many additional data points to look at how to keep rates competitive for you based on data and technology. CommonBonds overall goal is to help make student loans more affordable, transparent and easier to manage. 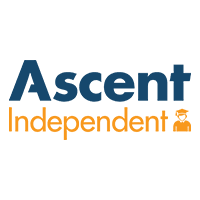 CommonBond has an award-winning customer support team who is there to help you every step of the way. Along with their great customer support, CommonBond also has no prepayment penalties or hassle fees. CommonBond offers the ability for a program they call CommonBridge which helps to temporarily postpone payments to on your loan if you run into any sort of financial difficulties. With one easy to fill out an application, you can see why CommonBond is one of the clear leaders in the space. Enjoy all that CommonBond has to offer and below. Funds can be used to pay fro qualified education expenses, including: Tuition, Room and Board, Books, Computer(s), and more. Get the loan you need to cover all of your college expenses.